The two-day OBS March Sale of 2-Year-Olds in Training kicks off Tuesday in Ocala, Fla., and the Paulick Report is pleased to offer a special print publication for the sale. In this edition of the PR Special, Natalie Voss looks into the potential pitfalls of a class of bone drugs called bisphosphonates. Frank Mitchell turns his Stallion Spotlight on the progeny of Will Take Charge and in Five to Watch, he gives us some hip numbers to pay close attention to. 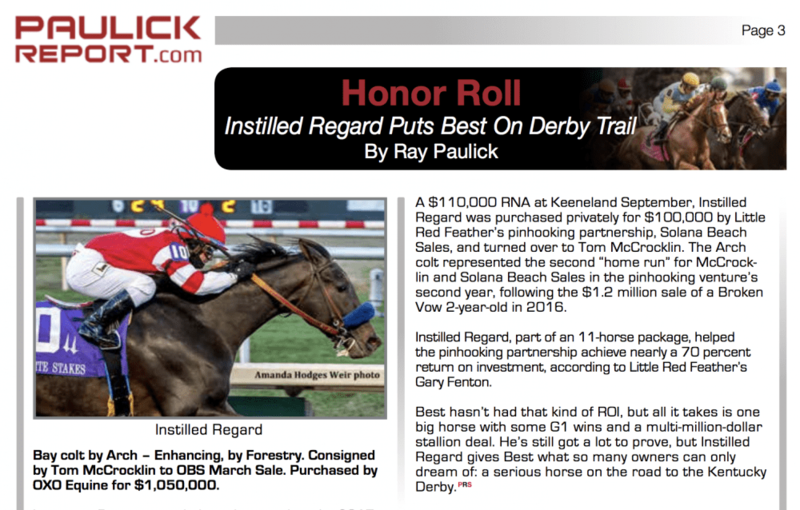 Kentucky Derby contender and $1 million-plus March Sale graduate Instilled Regard is the focus of the Honor Roll, and in Ask Your Veterinarian, a question about tie-back surgeries. Click here to view this PR Special OBS March Sale. This entry was posted in PR Special, Ray's Paddock and tagged instilled regard, obs, OBS March, PR special, Thoroughbred Auctions, thoroughbred sales, Will Take Charge by Paulick Report Staff. Bookmark the permalink.